The American Photography Open 2019 contest is now officially underway. (Please go here for information on how to enter!) As we get ready to view submissions from around the world, we will be profiling finalists from the contest's inaugural 2018 edition. Today we launch the series with a profile of Mauro De Bettio. Mauro De Bettio was born and raised in a little village in the Italian Alps, but he is now based in Barcelona, Spain. His passion for telling stories about people and cultures as a documentary photographer has taken him around the world. In Bucharest, Romania, for instance, he photographed a man who lives below ground, in the city’s railway tunnels. In Nepal he captured the lives of honey gatherers. In Bangladesh he shot portraits of victims of gender-based acid attacks. Two of his images were chosen as finalists in the American Photography Open 2018 competition — a photograph made at the Ursul “bear dance” festival Romania, a ritual that symbolizes the death and rebirth of time; and a photograph of ship breakers in Bangladesh. 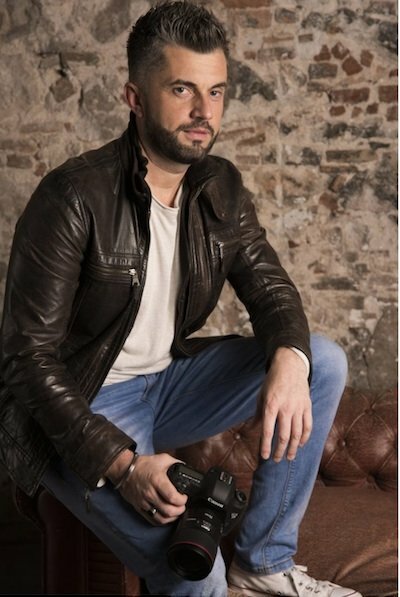 De Bettio, who was also named a winner of the National Geographic Italia photography contest in 2018, has had work published by National Geographic, LensCulture, Dodho magazine, Lens Magazine, Edge of Humanity magazine, and other publications. How did you get into photography, and how long have you been at it? I felt from a young age the desire to tell stories. I discovered that the camera was the right tool for me, the eye through which I could speak to the world. It was an instrument that began to walk by my side towards a long journey of discovery. Definitely, to grow by myself, without the influence of schools, courses and lessons, has slowed down the process of technical knowledge, but because of this I learned my own way of seeing. I’ve been formed and shaped by the environment and the people who surrounded me in my long travels. Although it is difficult to express, I think that the photograph represents my way of speaking, and what I try to do through my language is to capture the sense of what I breathe and touch with my hands. Not only in appearance but also, and especially, in the essence; trying to express nuances and subtleties contained in a single frame. I think that’s part of my personality and my work fully expresses what I am. My story, my soul. Do you do photography professionally? At the moment this is not my main profession, but my goal is, of course, to be able to make photography a constant part of my life. From your Instagram page, it seems that travel is a focus of yours. Is that right? It’s true that I’m traveling a lot, but the focus of my photography is actually on different cultures, people and their stories. This was taken at a festival on New Year’s Eve in the north of Romania. I remember this as a thrilling moment, where groups of enormous bears pour out from the back of old vans. They lined up one after another and started marching and dancing. The people dressed as the bears roar loudly, mimicking the sound of bears, swinging their enormous heads, imitating their gait and movements. I was very impressed with this ritual. It is an ancient ritual that brings together the whole community as they gather to watch the performance. Tradition holds it close to their hearts. I had the great opportunity to make incredible portraits. How did you come to make the picture on New Year’s Eve in Romania? When I choose a project I always start a long research first. As the ritual is held at the end of the year, I had to spend Christmas and New Year’s Eve traveling alone. The small village is a day trip by train north of the Romania's capital, Bucharest, and temperatures there are very low. Not easy, but when I'm “in the field” I forget everything around me. I become one with the place and the people I'm portraying. Let’s talk about your research. 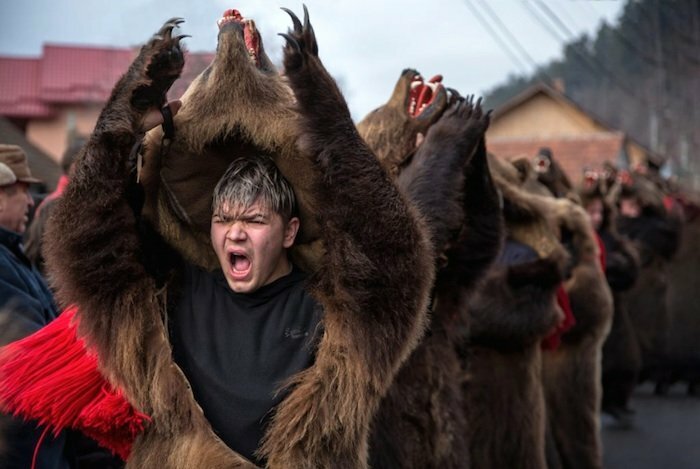 What preparations did you take to photograph the bear festival? To choose a project is always a long task. I try to discover rare or untold realities around the world. I want to tell a story and create an image that will incite emotions. 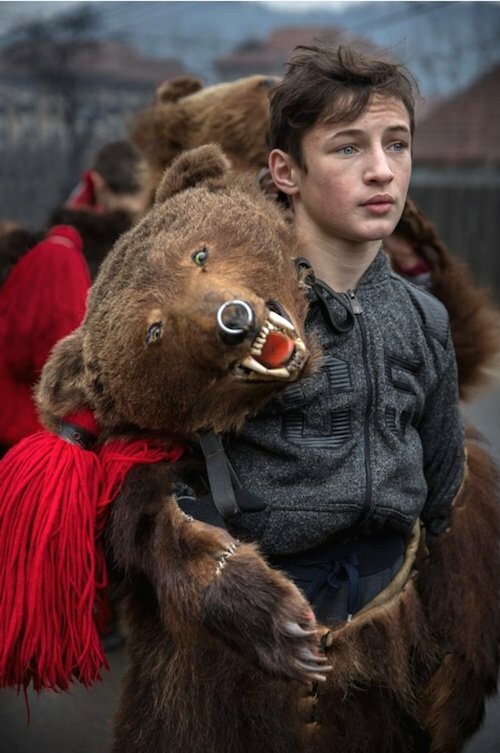 When I first saw a picture of this festival in which people wear bearskins, I immediately realized that there was a big potential. It took for me a while to be able to understand where to go, when to go and the gear I needed. But that is what it cost to be able to capture something new and original. Let’s turn to your other finalist photograph from the AP Open contest. 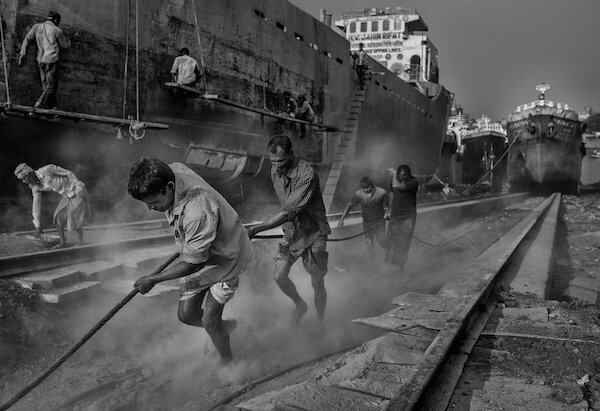 It’s titled “Rust and Sweat,” and it features ship breakers at the port of Dhaka, Bangladesh — people who demolish old ships in order to salvage scrap and raw materials. The ship breaking is a challenging process—the work is hard and dangerous. I wanted to be able to catch a moment like this, which contains in a single frame the enormous effort that these incredible souls make to be able to feed their families. How did you go about photographing them? To take this picture, first I was observing the ship breakers, sitting on a pier by the Sadar Ghat, the port of Dhaka. After a while I went deeper into this graveyard of ships, and into the lives of these people. I looked closely at the giant skeletons of the ships submerged with tireless workers. What camera and lens did you shoot the photos with? I am very loyal to Canon. I have been using their equipment for years and I must say that it has never betrayed me. For the bear festival I shot with a Canon 5D Mark IV and a variety of lenses — the Canon EF 35mm f/1.4L USM II, the Canon EF 85mm f/1.4 L IS USM; and the Canon EF 24-70mm f/2.8 L USM II. How did you hear about the American Photography Open competition? A friend who is also a photographer recommended this competition to me. After taking a closer look at it, I was very excited to take part. I saw this as an great opportunity. I believe competitions are there to enable you to grow and learn, and to reach more people with your images and the stories you tell. Besides that, you get to know other great photographers. It is an honor to be now one of the finalists. See Mauro De Bettio's work at his website and Instagram.